Baila y diviértete toda la noche en las mejores discotecas de Cancún, México. 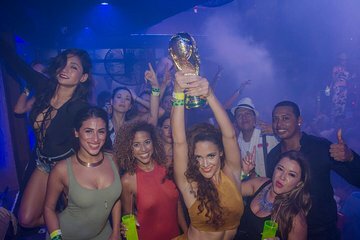 Salte de fiesta a 3 de los mejores clubes de Cancún en esta noche de 6 horas que incluye servicio VIP y bebidas ilimitadas. Salta de pie en largas filas con entrada VIP. La escena de la vida nocturna de Cancún es tuya para explorar en esta experiencia de club nocturno VIP. Club nocturno de seis horas en Cancún. 5 horas de bebidas en barra libre. Conozca a su guía personal de fiestas en el club nocturno de Cancún a las 10 pm y emprenda la búsqueda de la aventura. Siga a su guía a las mejores discotecas de Cancún para una noche que incluirá beber, bailar y divertirse. Conozca nuevos amigos durante este tour grupal de tres de los clubes nocturnos de Cancún, saltándose las largas filas de entrada. Una vez dentro del club, dirígete a tu mesa VIP. Disfrute de bebidas de cortesía en todos los clubes y servicio ilimitado de botellas al lado de la mesa en algunos. Las ubicaciones posibles incluyen The City Nightclub en Cancún, Carlos and Charlie's, Bar Congo, Mandala Disco, Dady 'O o Sweet Nightclub. Nota: Los clubes nocturnos visitados en Cancún pueden cambiar sin previo aviso. If you want to party like this is high school spring break this is good for you. The night was fun, but I felt like we overpaid. We went to 3 clubs, all within close proximity of each other and were able to get in right away primarily because there were no lines. The first club congo bar was good, but the drinks weren't great. The second club was by far the most fun, the pina coladas were delicious and the club was super cool. However, they threw paint and although it was fun the paint did not come off of my clothes. The third club Mandala was also good, but would've preferred to stay at the second club senior frogs. The guide was nice/fun. We had someone that was celebrating her birthday and they did a great job at making the night fun for her. We also had someone in a walking boot and they were very accommodating. Our guide was fun, but a little too social. When we got to the second club he started socializing and forgot to give us our new drink bands so for about 30 minutes we didn't have anything to drink and couldn't go to the bar because we didn't have our bands. Overall it was a fun night and we all enjoyed ourselves! Great time, but needs a little better communications about meeting point. Other than that had an Amazing time! My girls and I really enjoyed this package!! The host was amazing and made sure we had a good time!! The liquor was unlimited and VIP treatment was wonderful!! Each club made us feel special and the host kept us going!! I would do this package everyone coming to Cancun!! Great experience!! Was a great night! If you like meeting new people and love dancing all night, this will be a treat. I would only change the drink menu, wasn't loving the drinks. AMAZING!!! Ernesto was so much fun and helpful. Definitely felt safe and protected the whole night while having a blast at the same time! Do this every year and every year have an amazing time!!! To my surprise-- I had a really good time. Upon arriving, I was asked for an additional 6.00 tip, was not sure about it, as I already had pay a hefty price, but anyhow I did give the tour guide the money. He was very nice and attentive to me, as I was by myself, so no issues there... I would recommend this tour to any single lady traveling alone. I felt safe at all times and made some good friends along the night.